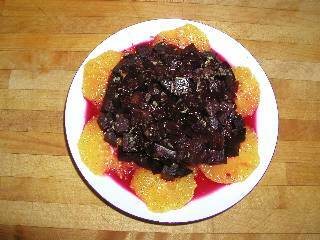 Beetroot and Orange combine together make this unusual but simple dish. The sweet of the orange complements the sweet of the beetroot whilst the orange adds the balancing acidity. Serve as a starter or as part of a main course. This is one of many free beetroot recipes that we have that include traditional beetroot recipes (boiling, roasting and pickling), curried beetroot, beetroot chutney and beetroot soup (bortsch). 3 tablespoons (45ml) of vinaigrette made from olive oil, white or red wine vinegar, crushed garlic and a little mixed herbs or use a commercial basic vinaigrette product. Boil the beetroot to cook thoroughly (see here for instructions). Skin the beetroot and cut into small (5mm) dice. Mix with 2 tablespoons of the the vinaigrette and leave to stand for 30 minutes or so. Peel the oranges with a knife right down to just expose the flesh then cut them into thin wedges about 6mm thick. Arrange the sliced orange around the edge of a medium sized plate and sprinkle with the remaining vinaigrette. Make a heap of the diced beetroot in the centre of the orange circle and pour any juice over the top. Garnish with the chopped parsley or coriander and serve.